We live in a land that has been greatly altered by man. You can see that in most every habitat in the state. Many of our rivers and streams have been very much altered. In fact, I would bet that if you could jump in a time machine and travel back a couple of hundred years, you would not even recognize some Nebraska rivers and streams. SCHUYLER — A major Nebraska watershed made history Friday for the cleanup and reduction of Atrazine, which has greatly reduced negative impacts on aquatic life and overall health of the area. Shell Creek’s water, fish, frogs and other aquatic life are the healthiest they’ve been in decades. Officials said it appears to be the first example of a stream being removed from the “Impaired Waters” list that resulted from implementation of a comprehensive watershed management plan. Shell Creek includes more than 304,000 acres, stretching from Newman Grove to Schuyler. Atrazine is a common herbicide used to kill weeds. It’s linked to cancer in humans and can give aquatic life deformities. This historic accomplishment took more than 12 years to complete. The Shell Creek Watershed Improvement Group is a group of landowners and farmers who led the grassroots efforts in conservation. They worked collaboratively with a variety of partners on the local, state and federal level, including the Lower Platte North Natural Resources District, the Nebraska Department of Environmental Quality, USDA Natural Resources Conservation Service, Environmental Protection Agency and other project partners. More than 240 landowners have participated in the program so far, putting more than 340 conservation practices on the land. Examples of these conservation management practices are no-till farming, filter and buffer strips, and cover crops. 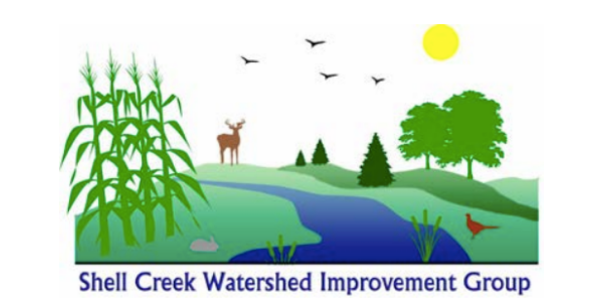 These efforts improve the quality of water draining into Shell Creek. As a result of these practices, the Atrazine level has significantly declined and is now supporting aquatic life in the creek. “I grew up a quarter mile away from Shell Creek and my siblings and I spent a lot of time there,” said Matt Bailey, co-chairman of the Shell Creek Watershed Improvement Group. “It’s a great feeling to think that my kids will be able to see the shells I didn’t see in the creek. The stewardship of this water is the responsibility of all of us as producers and landowners. Nebraska Go. Pete Ricketts lauded the group for its accomplishments. Shell Creek was first added to the Clean Water Act List of Impaired Waters by the Environmental Protection Agency in 2006 because of impairment of aquatic life caused by Atrazine. “It was the grassroots initiative of the Shell Creek Watershed Improvement Group to promote and grow interest in the restoration plan and the producers who stepped up to adopt conservation practices that led to this achievement.” said Jim Macy, director of the Nebraska Department of Environmental Quality. Educating Nebraska’s youth about the importance of water quality also has been a large part to this project. Newman Grove High School and Schuyler Central High School have developed summer volunteer programs to take samples of Shell Creek’s water, sediment and bugs to help monitor the creek’s water quality throughout the years. These samples provide valuable information on the creek’s health, and the students get a rare hands-on opportunity to learn more about Nebraska’s natural resources. Among the students who spoke Friday were Payton Nelson and Abbie Pieke of Newman Grove High School and Tyler Kohl of Schuyler Central High School. That is a great start, but there is still a lot more to be done. Glad to see students involved because they are the ones that are going to have to continue these efforts! The post A Lake, or a Stream, is Reflection of its Watershed appeared first on NEBRASKALand Magazine.